Amanda Barnhart (right), manager of the Kansas City Public Library’s North-East Branch, and Crystal Faris (center), the Library’s director of youth and family engagement, look over breakout box materials with two of the nine teens who helped research and create them. 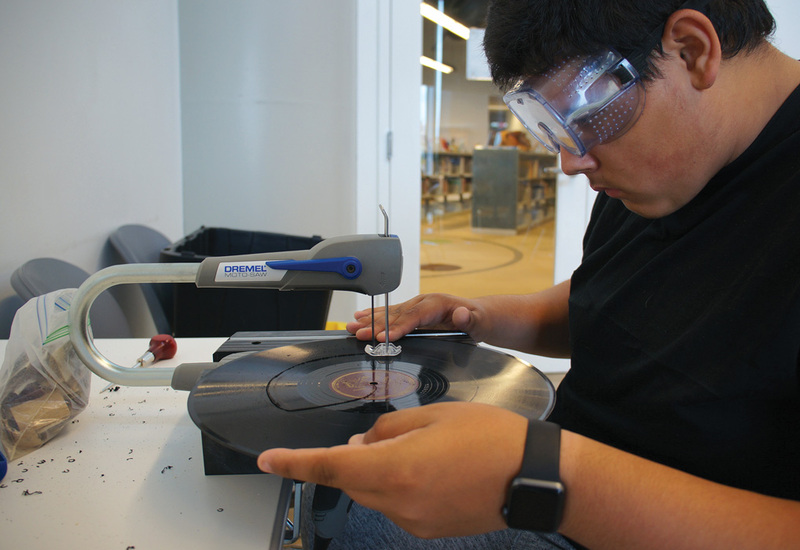 Teen intern Victor Urtiz works on a prop for a breakout box spotlighting Kansas City’s jazz history. Props and other materials for a breakout box spotlighting legendary Kansas City saxophonist Charlie Parker. b) Lose yourself in Fortnite. c) Steep yourself in Kansas City’s early 20th-century jazz history, in Count Basie and Charlie Parker and the groundbreaking Women’s Jazz Festival, meeting weekly with other teens at the Kansas City Public Library to learn their stories and work them into a series of newly created games that promote critical thinking and collaboration. Nine area middle and high schoolers bought into the academic exercise earlier this year, though calling it that is a bit disingenuous. 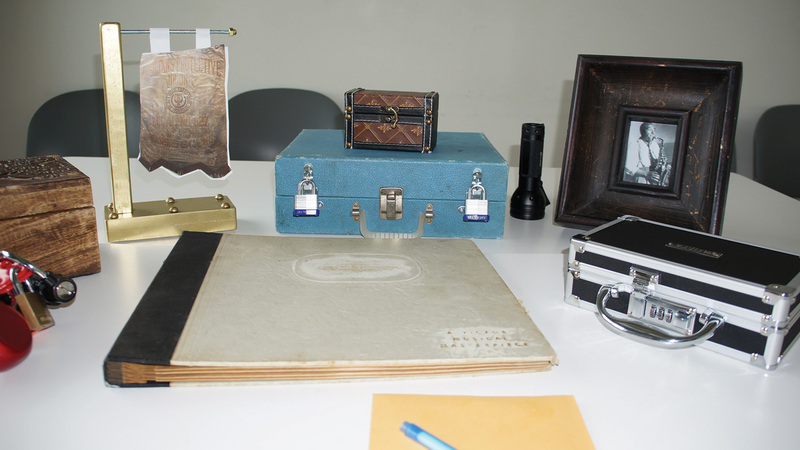 The teens researched and created breakout boxes, which are modeled after popular escape rooms in which players think through a series of puzzles to break their way out of some kind of locked, windowless chamber. The goal in this case is to break in, working through clues and multiple locks to open a smaller-than-a-suitcase-size box — against time. There was some cool to it. Breakout boxes, like escape rooms, have been around for several years now, becoming increasingly popular among teachers and libraries in search of ways to engage younger patrons. There are kits for purchase — you can browse more than 800 on BreakoutEDU.com, where they go for $150 each (or $800 for six) — but Mayo, Bates and others at the Library liked the idea of deepening the learning experience by having teens research and develop them. They also saw an opportunity to expose the history-sleuthing youngsters to the Library’s Missouri Valley Special Collections, home to a trove of materials on the city’s rich jazz heritage. The Library sought and got a Library Services and Technology Act (LSTA) grant to underwrite the project. Fifty-four interested youngsters applied. Nine were selected, and they agreed to commit four hours a week over six weeks in June and July. 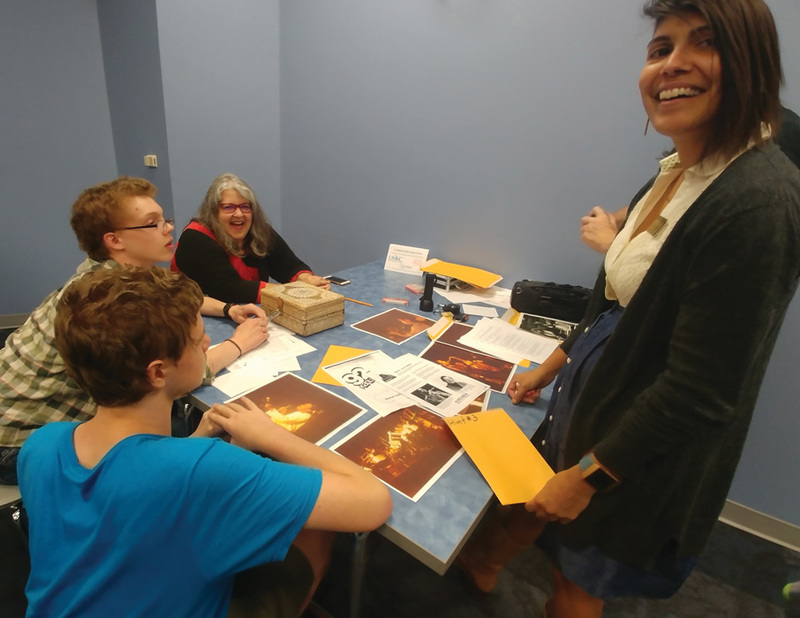 The teen interns divided into three teams, two meeting at the Library’s Plaza Branch and one at its Trails West Branch, and each settled on a breakout box subject. Count Basie was instrumental in developing the Kansas City style of jazz and lent it national exposure. Saxophonist Charlie Parker was a homegrown superstar. The Women’s Jazz Festival was a showcase for top female performers from 1978 to 1985. The teens’ research included visits to the University of Missouri-Kansas City’s Marr Sound Archives and the onetime epicenter of local jazz in the historic 18th and Vine district. They tapped the expertise of the Marr Sound Archives’ curator, Chuck Haddix. “They knew these topics front and back by the time they were done,” Mayo says. Bits and pieces about Basie, Parker and the Women’s Jazz Festival were worked into props for the breakout boxes: sheet music, a vintage radio, an old record player and record. The numeric code for a lock on one box was 1580, the frequency of a radio station that broadcast Basie’s performances from the old Reno Club. For another, it was 627, referencing the formal name of the old Mutual Musicians Foundation (Local No. 627 of the American Federation of Musicians). The exercise checks a number of 21st-century job-readiness skill boxes, promoting creativity, problem solving and teamwork. And Mayo points to something else. The three student-designed breakout boxes are now being incorporated into Library activities, from teen lock-ins to a planned three-day play-a-thon at the Plaza Branch in January. The plan is to create more kits, gearing some to kids in lower grades that will focus on informational literacy, library skills and pop culture. For older players, there’s no shortage of subject matter.